Then there are the folks who change their mind about buying some item and put it on the nearest shelf, rationalizing that the store hires people to put things back. Well, schools employ custodians to clean the halls. Does that mean it’s OK for kids to throw their candy wrappers on the floor? LOL, Charlie! That reminds me of Christine Lavin’s song, “Shopping Cart of Love.” Thank for triggering a happy thought. The ethical challenge of “It depends on what you call an item…” is not easily resolved. If the store has a BOGO promotion or “3 cans for $4” is the total number of items the qualifier or is the unit of the offer the proper count? I always assume the store’s declared unit of sale beats the number of items in the basket. But then, I’m always happy to let the bleeding customer cut in front of me to buy one roll of gauze. 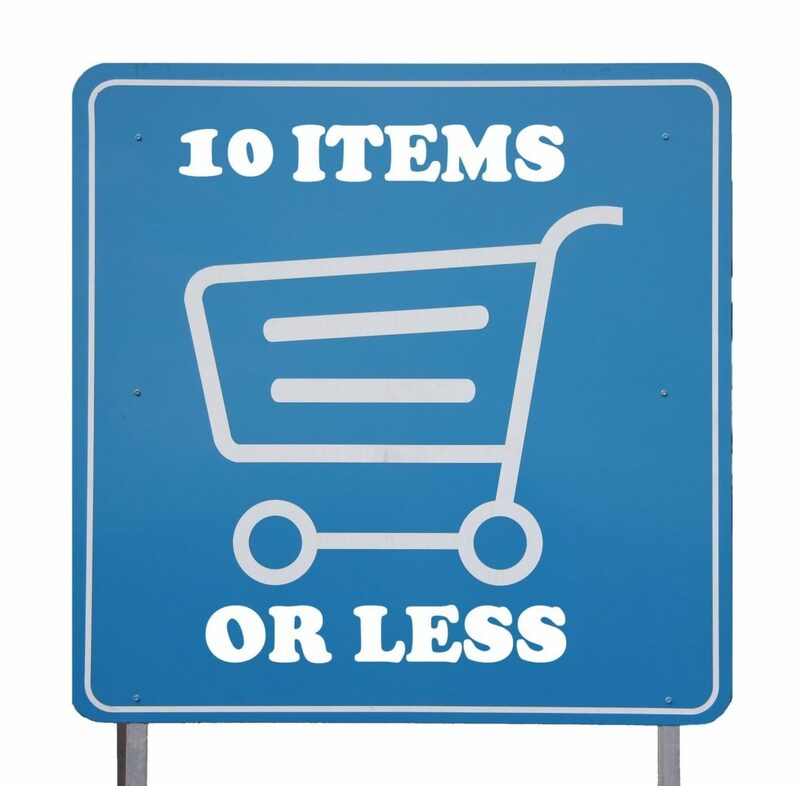 To make things fair and straightforward, observe the notification: 15 ITEMS or less. In other words, a customer has 6 of the same item. Normally, the cashier will scan one then press ‘6’. However, there are 6 items that are put in their bag. Rather than make this a complicated issue, just honor the INTENT of the notification, since it is meant to help folks with few items that would otherwise need to wait behind customers with full shopping carts in an ‘all orders’ line. Yes, the six-pack of soda is handled, scanned, and bagged once. Many of us – at one time or another – will be the customer that needs to get done soon. Ouch. I rationalize and put things back where they don’t belong. I’ve been an express line cheater. I guess I better start acting more like I think! Thank you, Michael, for bringing topics such as this to our attention. It often brings it on home as it did to Judy and, perhaps, others (me). But what do you do when you get in a non-express line that is long and an open checker calls to you from the express check-out lane? Inevitably, once you go over there even after saying you have too many items and them saying it is okay to check out in that lane, three more shoppers who actually DO have ten items get in line right after you. Then you feel like a heel even though you protested and tried NOT to go over to that line. They glare and make you feel like the bad guy. This has happend to me more than once. Now I just smile and tell the express lane cashier “No Thankyou”. Oscar Grayson raises an interesting point. As a former express-line cashier, here’s my take on what constitutes an item: if the cashier handles and scans it individually, then it’s one item, regardless of how it’s priced; for example 3 cans for $4 still constitute 3 items. If, however, you select 3 lemons or grapefruits for $4 and put them in a plastic produce bag with a twist tie, then the cashier & bagger only have to handle it once and it counts as one item. Likewise, if it’s a 6-pack of soft drinks linked together by a set of plastic rings, then it’s handled once and counts as one item. Thanks for this very sensible, helpful expert opinion! Michael, you left out the biggest one: people who “test” the fruit by eating a few without paying for them (e.g. grapes, cherries, plums). Small theft is still theft, and it raises the prices for the rest of us. Linda, those people are on a mission to build up their immunity! 🙂 They test the fruit and it insures that they get their daily supply of toxic chemicals, along with all of the germ bugs left by the pickers whose hands have been on the fruit after they have worked all day making multiple uses of the Rent-a-Can and not washing afterwards. We would do well to strike the phrase, “That’s not my job” from our human lexicon. Considerately playing by the rules has always been nicely aligned with our eternally wise and rich “Golden Rule”. Strong and positive character has not always been necessarily the “easy way” however. Coach Wooden absolutely demanded certain dress codes, shoe tieing methods, respectful speaking habits, focused/devoted practice routines that grew stronger TEAMS; however the “personal responsibility” of champions rests in the soul before the mind. A hero such as Coach Wooden would support the theme of this “commentary”; yet I don’t think it goes deep enough to what “best effort successful character” really is ? :):) Thank you for this opportunity to attempt my perspective on the vital subject. Can ethics/good character be taught later in life or does it stem from nurture? Today most employers are 1st examining candidates’ characters before their talents/skills/accomplishments. If one has good character, the other requirements can be much easier taught on the job. Many employers will hire people that may lack some of the requirements for the job because of the potential employees healthy attitude. They are often willing to teach the person the needed skills. The problem of the Express Lines item limit, is that many times the checker has told be that he/she gets in trouble with the manager if they try to enforce it. The manager doesn’t want an unhappy customer (the one with too many items) but doesn’t realize that there are 5-10 unhappy customers behind that one! I have witnessed checkers very gently reminding a customer about the item limit and sometimes it’s just the fact that the person didn’t see the Express sign, other times they get very apologetic and put items back in a basket and go to the other lanes. But we must remember that the checker is the one who is caught in the middle. How we behave in the parking lot outside the grocery store is also an ethical dilemma. After loading the groceries into our vehicle what do we do with the cart? Do we leave it in the parking space to have it migrate to the other end of the parking lot, careening off other vehicles and customers along the way? Do we lean it against the curb, hoping someone will recover it later? Do we push it a short distance to the shopping cart return area? If we are close to the front of the store do we return it to the store itself? We can rationalize that the store has employees to recover the carts. Does that diminish our responsibility? How we drive in the parking lot is an indicator of our attitude. It is a parking lot with people walking everywhere. Back up cautiously, drive courteously. There will be store employees trying to recover those shopping carts left all over the parking lot!